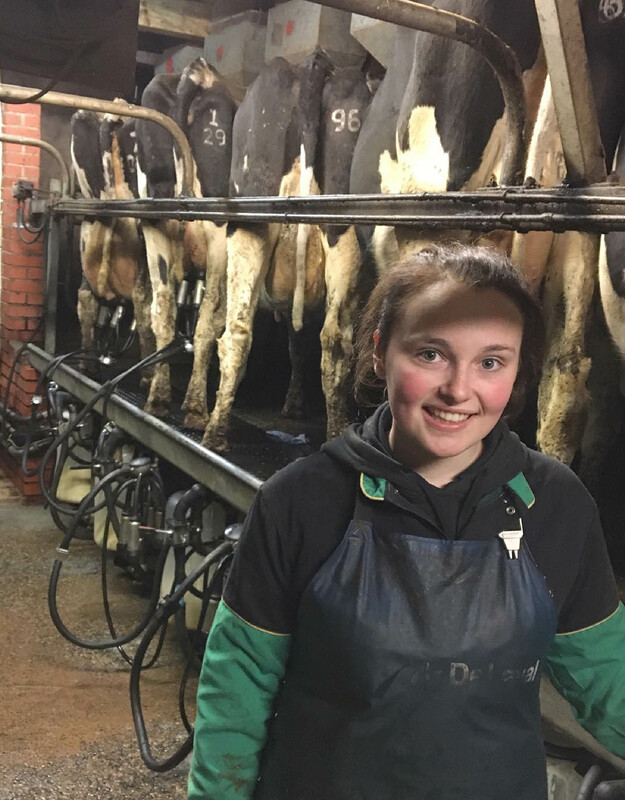 Passion: Considering I have lived on the family farm since I was born, my real interest only truly developed when I was around 13 years old. This was a time when I needed some extra money so working on the farm seemed the easiest option. Little did I know it would be hard work and many hours of my time, but from then my love for the farming industry grew. When it came to applying to college, my mum was adamant she would not let me study agriculture until she realised it was my passion. I now work several days a week on the family farm alongside my course at Myerscough College. I am currently in my final year and hoping to go on into higher education, though I have not decided where that may be. Project: On the farm I usually milk the cows alongside other jobs such as feeding calves and bedding up. I recently started a trial for my investigative project at college, comparing calves being fed on waste milk with calves being fed on milk replacer. I am hoping to see if there is any beneficial gain on weight and health for the calves at the end of my project. Coming into farming at a young age can help develop workmanship skills as well as life skills. Along with education under my belt, I am hopeful there is a possible future for young farmers like myself to be able to earn a living and do what we love the most. I am hoping in the future to either help run the family farm or become a farm consultant as I could not imagine life any other way. On November 9, I attended the annual NFU conference on tenant farming at Macdonald Kilhey Court, Wigan. The conference enhanced my knowledge as well as opened my eyes to what could possibly be my future as a tenant and how working hard can get you where you want to be. Young Farmers: I have finished my year as social secretary at Chorley Young Farmers. A huge part of the role was to make sure there was a meeting each week and to try and gain some new members with our new members evenings. I have competed in various competitions and achieved Junior Member of the Year voted by the other members of the club. I enjoy all the social aspects of Young Farmers as there is plenty of nights out and social events throughout the year. I am especially looking forward to attending the Blackpool AGM in 2018. Christmas: Christmas should be quiet this year; we have finished calving now until the end of January to avoid any hassle between Christmas and New Year. This will give me plenty of time to spend with my family and friends and re-charge my batteries ready for the year ahead. Sally Burton, 17, works on the family farm alongside her uncle, David Marsden and farm worker Robert Fitton. They farm about 80 hectares (200 acres) based over two farms, and milk 90 cows.